St. Boniface Church is on its way to becoming a 75-bed senior housing facility. The Oak Brook-based IPM Amicus development firm closed Oct. 20 on the building at 1358 W. Chestnut St. The $20 million project will "save as much of the facade (towers) as possible," according to the IPM website. The firm's portfolio includes the Techny Towers Conference and Retreat Center near Northbrook and Spertus Institute of Jewish Studies at 618 S. Michigan Ave., plus campus projects at the University of Chicago, Catholic Theological Union, Moody Bible Institute, Meadville-Lombard Theological School and East-West University. 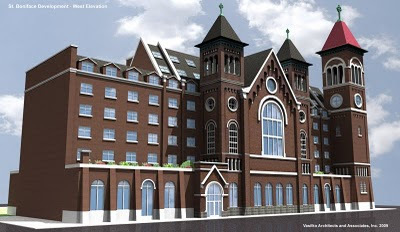 Plans for St. Boniface by Vasilko Architects & Associates show a five-story west building behind the original towers, plus an east addition rising to eight stories. IPM expects to complete the facility by the end of 2013. The Eckhart Park Community Council has called a "next steps" meeting at 7 p.m. Oct. 27 at the Northwestern Settlement House, 1012 N. Noble St. "One issue on the table," said EPCC webmaster Dominy Edwards, "is the possible reuse of the school facade that was dismantled and put in storage, reportedly at a cemetery, in 2003 when the Archdiocese of Chicago demolished the school and convent that stood to the east of the church." In any event, the Eckhart Park group has a line to the developers. IPM told the group it is "committed to working with the community and preservationists," according to the Eckhart Park website. Ken McHugh, IPM chief executive, said the church has sustained considerable damage in two years, according to the preservationist site saintbonifaceinfo.com. On Friday, a development teem found flooring and roof damage. The building must be secured after signs of basement break-in. “Fortunately the exterior, while suffering the passage of time, gave us encouragement that our mission of incorporating the front and west facade into the new senior housing structure remains feasible.” McHugh said. IPM bought the church and is leasing the land from the archdiocese in a land swap with the city that expands St. Joseph-Immaculate Conception school to the former Byrd Elementary site at 363 W Hill St.